Culinary mash-ups have become a hot fad. The most talked about has to be the cronut, Dominique Ansel's creation that's part croissant part doughnut and has people lining up down the block every morning to snag one from his Soho bakery. One of the more unusual mashups popping up is the ramen burger, basically a hamburger but with buns made from ramen noodles. Given the saucy condiments burgers are served with, the loose structure of noodles strikes me as a messy bun substitute, but I thought they might work well for tacos. 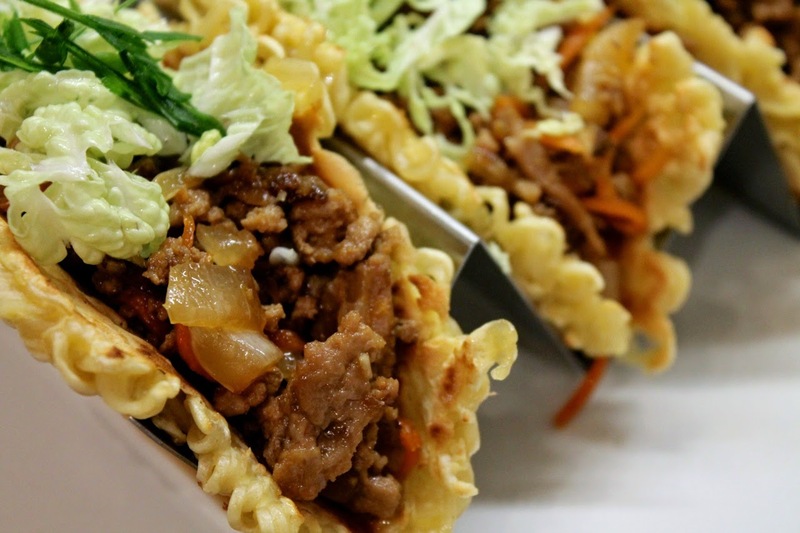 I've seen recipes for ramen tacos where ramen is just another taco filler. I wanted something more. I wanted ramen to be the taco. 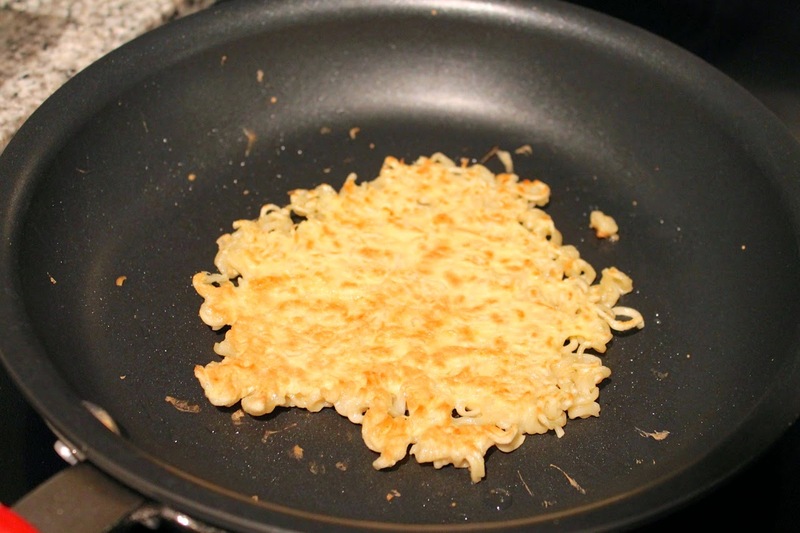 Inspired by recipes for ramen pancakes, I set about creating a recipe for ramen tacos consisting of a noodle tortilla and a filling inspired by other ramen soup ingredients. For the ramen tortilla, I used a lot of egg and a little flour as a binding agent for the noodles. 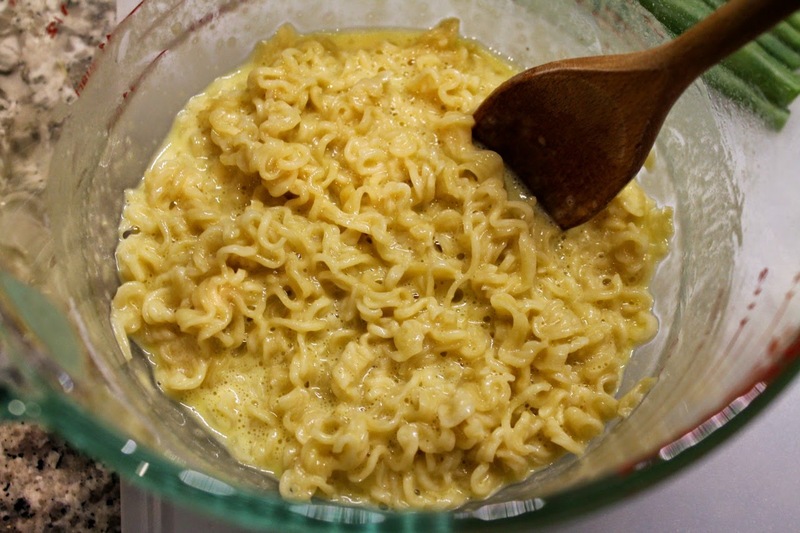 These ingredients also filled in the spaces between the noodles, preventing the filling from dribbling out, which would make for messy eating. To help parcel the dough better, I broke the noodles up before cooking them. I cooked them a minute shy of the package directions, figuring they would cook a bit more in dough form while in the hot pan. I was able to make three taco-size tortillas from a single package of ramen. I wanted the filling to be inspired by ramen soup, but not a slave to it. 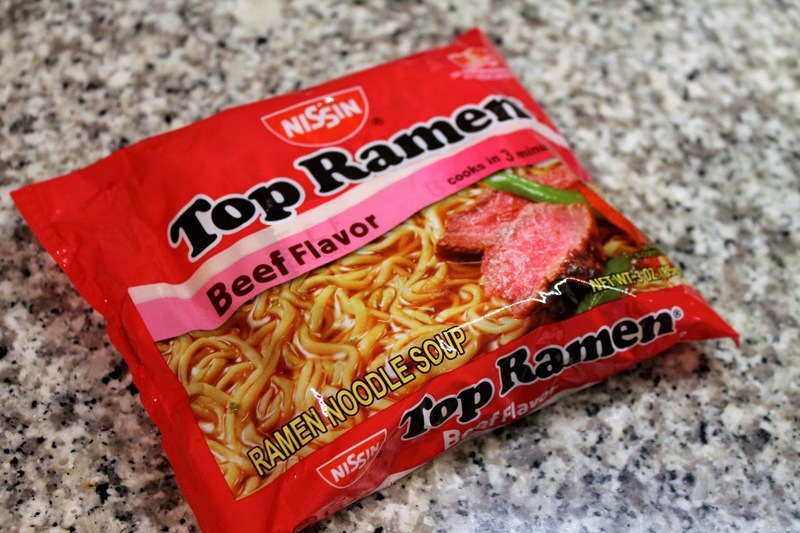 Pork is a common ramen ingredient, which I used in ground form, since it's more taco-like. I also used shiitake mushrooms, which are also common, along with scallions, although I added them raw as a final topping. Since slaws also make a great taco filling, I finished the tacos with a simple napa cabbage slaw flavored with the Asian touches of rice vinegar and dark sesame oil. So, how did they taste? Not bad. The noodles were a bit bland. You could incorporate the seasoning packet, although I think that might make them too salty. Instead, I've recommended adding a pinch of kosher salt. The taco filling was fantastic, albeit a bit greasy, so be sure to drain the ground pork after it has browned. As far as cooking time, well, cooking noodles then making tortillas while also prepping and cooking the filling and assembling the slaw is not exactly something you'll want to do in a hurry. Nonetheless, if you have a ramen lover, a taco lover or ideally both, I'm sure they would love you for serving this. It's a foodie hipster's dream mash-up. 1. 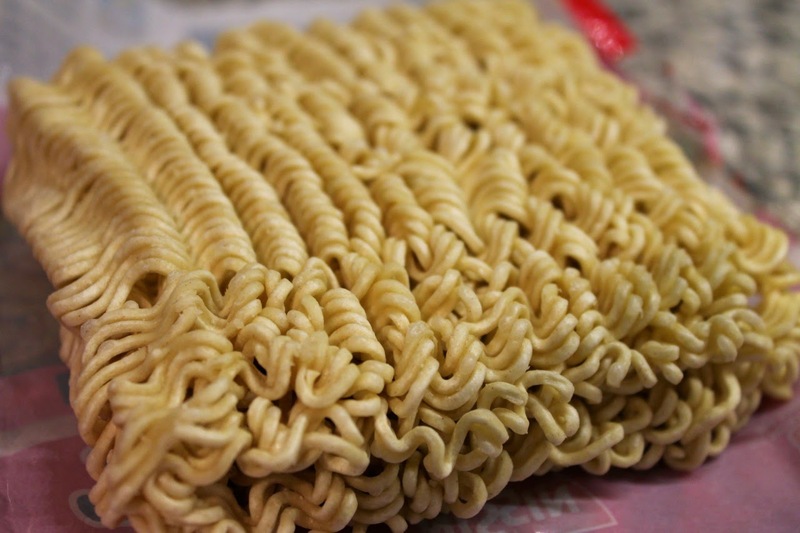 Break the ramen blocks up into pieces about 2 inches wide. 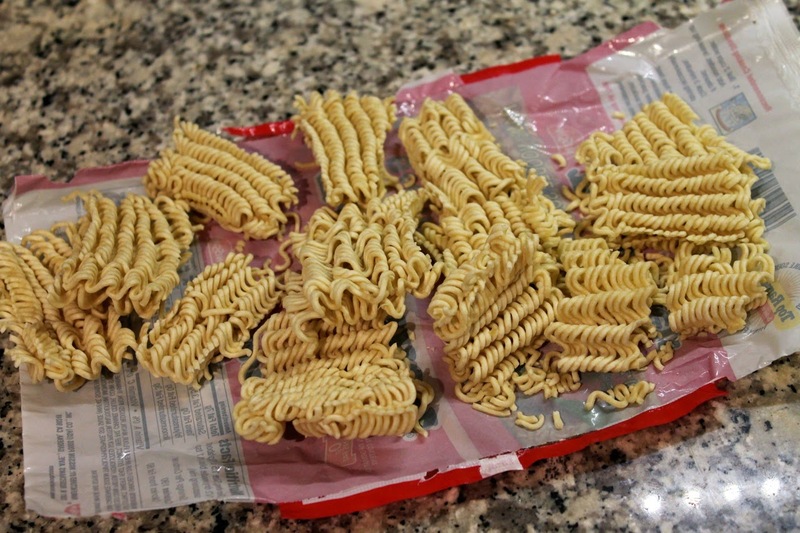 Boil the ramen noodles 1 minute less than package directions (I boiled mine for 2 minutes, since the package said to do it for 3). Drain thoroughly and set aside. 2. Whisk together the eggs, flour and salt. 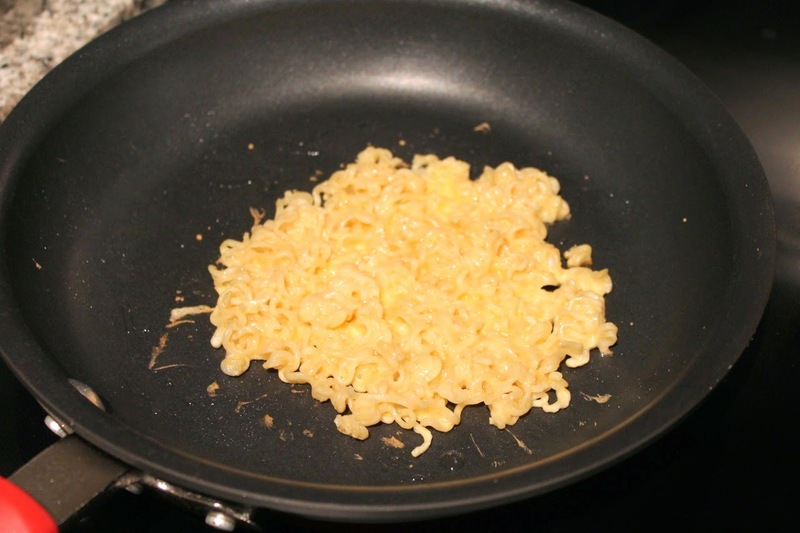 Add the noodles and stir with a spoon (don't use a whisk) until the noodles are thoroughly combined with the egg mixture. 3. Heat a medium frying pan over medium heat. Add the oil. 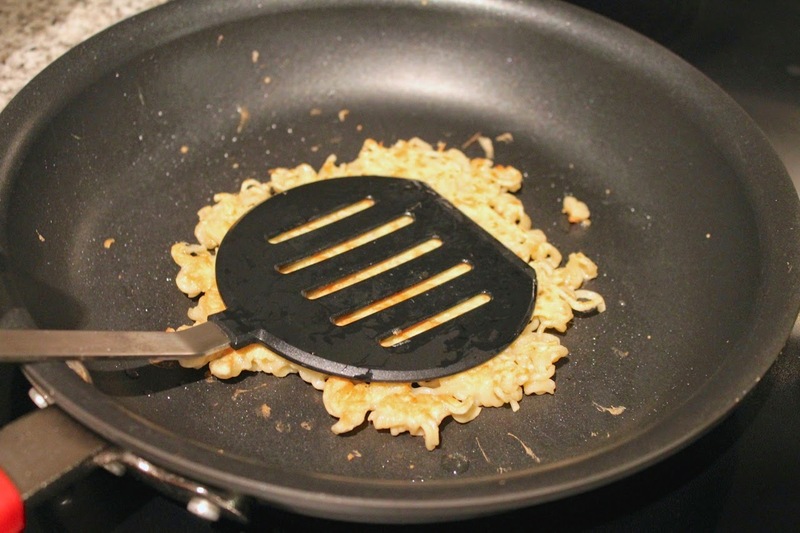 When hot, scoop 1/3 cup of noodle dough into the pan. Use a small spatula to immediately and carefully spread the dough into a circle of about 5 to 6 inches in diameter, being careful not to create any holes in the middle. Cook for about 2 minutes until lightly browned on the bottom. Flip and cook another minute until lightly browned on the other side. Transfer to a paper towel-lined plate then place in a taco holder (if you have one). Repeat with the remaining dough, which should make 6 tortillas in total (3 tortillas per ramen package; multiply the recipe as desired). 4. Brown ground pork in a large sauté pan over medium heat. Remove cooked pork with a slotted spoon, reserving the pan drippings (remove any in excess of 1 tablespoon). Increase heat to medium-high. Add onion and carrot and sauté until softened, about 5 minutes. Add the shiitake mushrooms and continue sautéing until browned, another 5 minutes. Remove from pan. 5. Add canola oil to pan. When hot, add the ginger, garlic and red chili pepper flakes. Saute briefly, about a minute. Combine the soy sauce, sherry, vinegar, sesame oil, sugar, water and fresh-ground white pepper in a small bowl and then add to the pan. 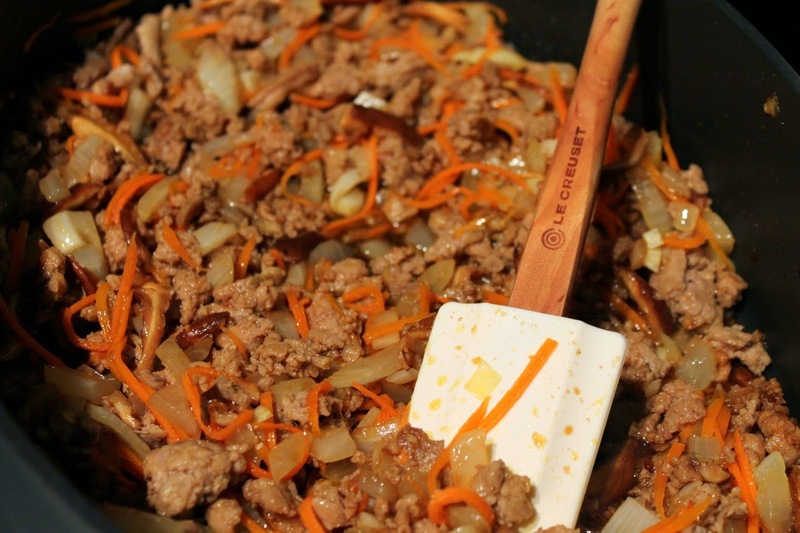 When the mixture bubbles, reduce heat to medium low and return cooked pork and vegetables to pan, stirring to combine. Remove from heat. 6. Place the shredded cabbage in a large bowl. 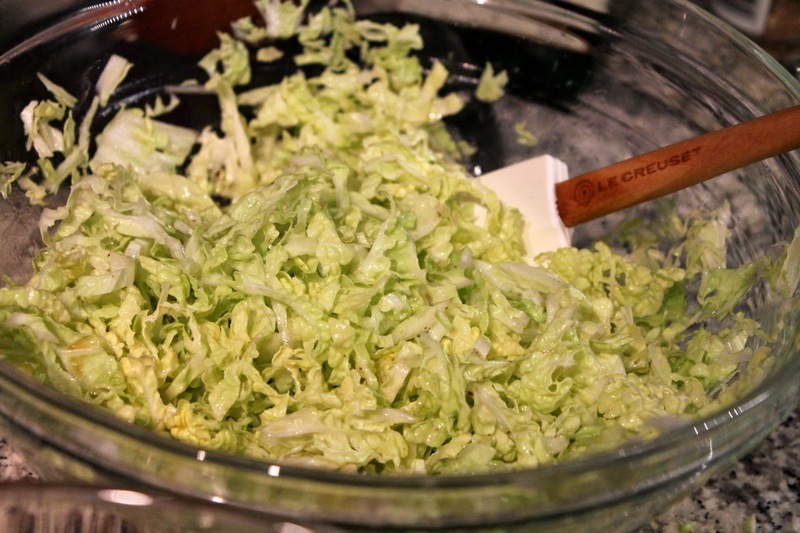 Combine the vinegar, lime juice, vegetable oil and sesame oil in a small bowl and pour over the cabbage. Toss to combine and set aside until ready to use. 7. 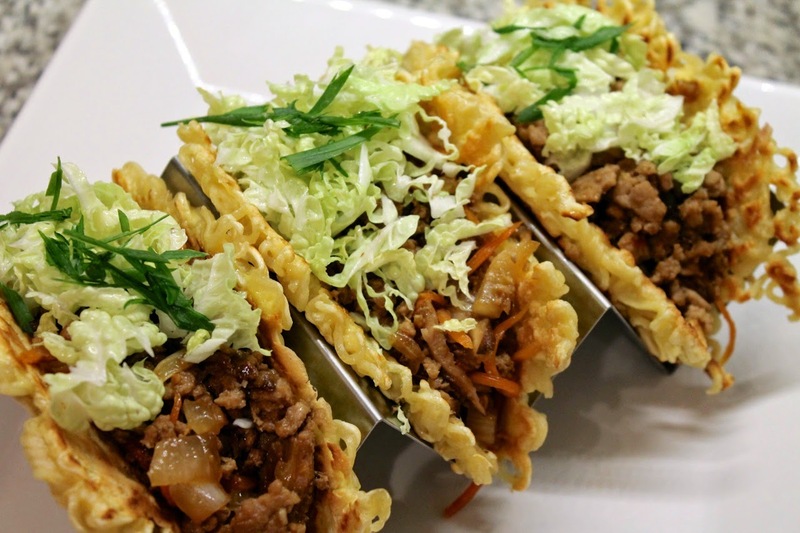 Place a big spoonful of pork filling on each ramen tortilla, top with slaw and sliced scallions and serve, preferably in a taco holder. From what I hear, this masterpiece produced a lot of dishes. I'll confess: I'm glad I wasn't home when you made this so I didn't have to deal with the clean up. Is that wrong? This is so creative!!! Love it. Thanks Johnna! I had a lot of fun coming up with this.